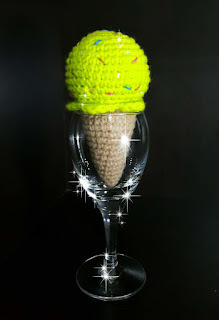 *Sew rainbow colour yarn on the Ice-cream body. **Stuff Ice-cream body with Poly-Fil and sew onto the CONE's body. Use Light Brown colour yarn. Round 15: Fasten off and hide the tail. * Stuff the CONE's body with Poly-Fil. Position and sew Ice-cream onto the CONE's body.